Is your business open more than 8:00 am – 5:00 pm? So are we! 24 hours a day – 7 days a week. We service it all, from small split systems to large package equipment. 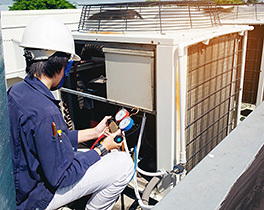 We have trained technicians to service and maintain your heating and cooling equipment. Our programs can save you enough money to pay for your maintenance, make your system last longer, have fewer emergency repair calls, and keep your staff and customers more comfortable. Air quality ultimately impacts your health and the well-being of your loved ones in your home. Business owners recognize the importance of their employee’s health and need to adhere to certain air quality standards. Proper cleaning of your heating and air conditioning ducts is the first step towards better air quality in your home or business. Very prompt, professional and courteous. We’ve been a customer for many years, and highly recommend. 100% money back guarantee! Service, maintenance, or new equipment, we guarantee everything we do.